Scott Bloomquist is back in the lineup after his time in the penalty box last night. He’s also quickest in Group A qualifying at 14.525. Earl Pearson Jr is quickest in Group B. He turned a 14.880. 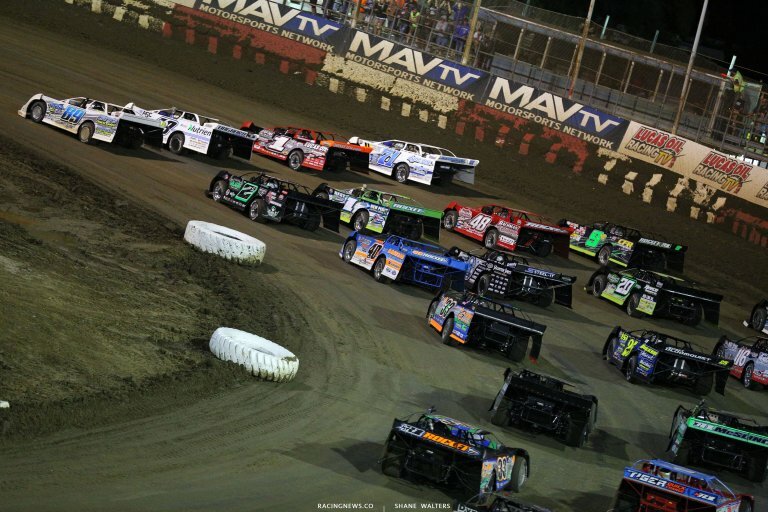 Scott Bloomquist and Jonathan Davenport set the front row in heat race number one. Green, Bloomquist leads on the bottom in turn one. He opens a gap of 3 car lengths. Lap 2, Davenport is on the bumper of the leader off turn four. He heads for the bottom in turn one. They’re side by side down the back. Davenport cuts to the bottom in turn three. Davenport is quicker through the center of the corner. He’s clear off turn four. Lap 4, Vic Hill is around in turn four. Michael Lake comes into the scene with nowhere to go. He’s in a four wheel slide to avoid him. He makes right rear to left front contact. Lake rolls over lightly. The red flag is out. He climbs from the car. 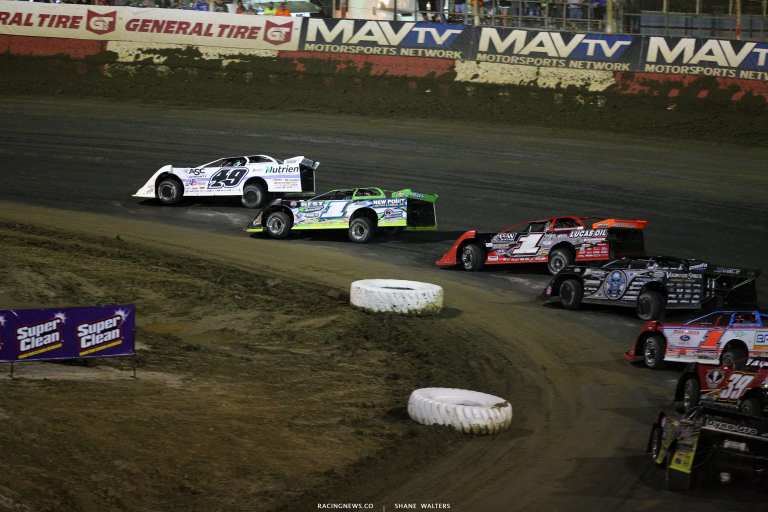 Green, Davenport leads Bloomquist onto turn one. 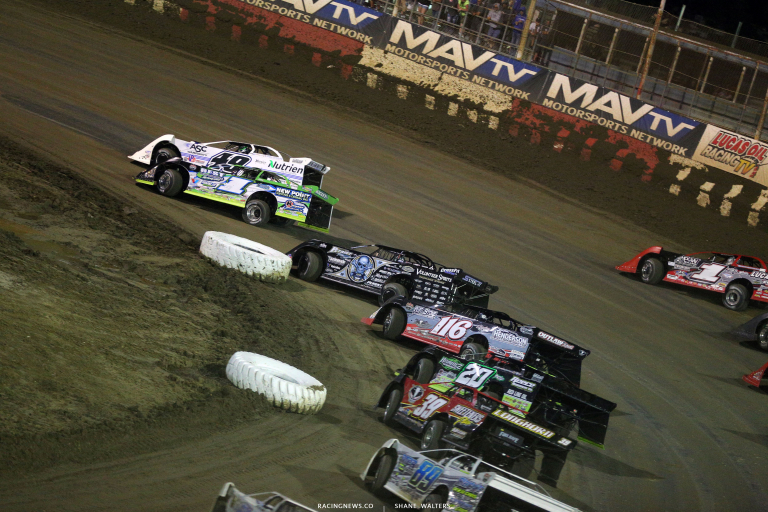 Bloomquist spins the tires off turn four, Davenport opens the gap. 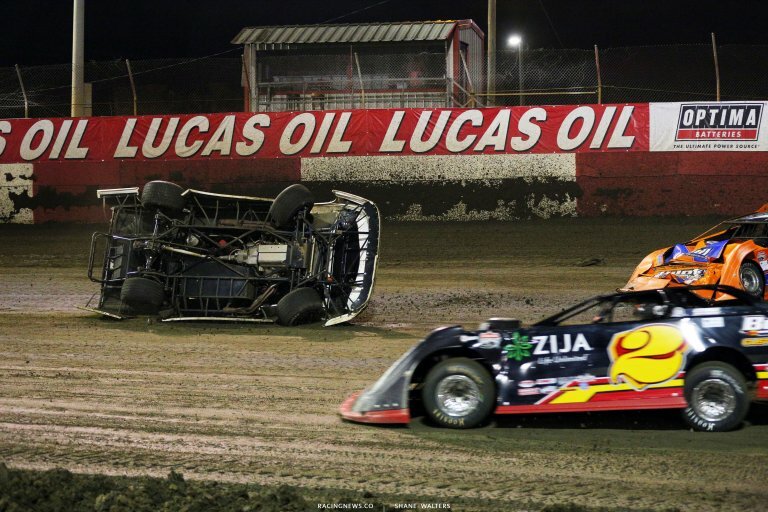 Billy Moyer Jr slides Bronson in turn two. He doors Bronson on the way by. That’s a battle for 4th, the final transfer spot. Davenport drives off to take the win! Bronson is not happy with Moyer Jr. He runs him down after the checkered flag. 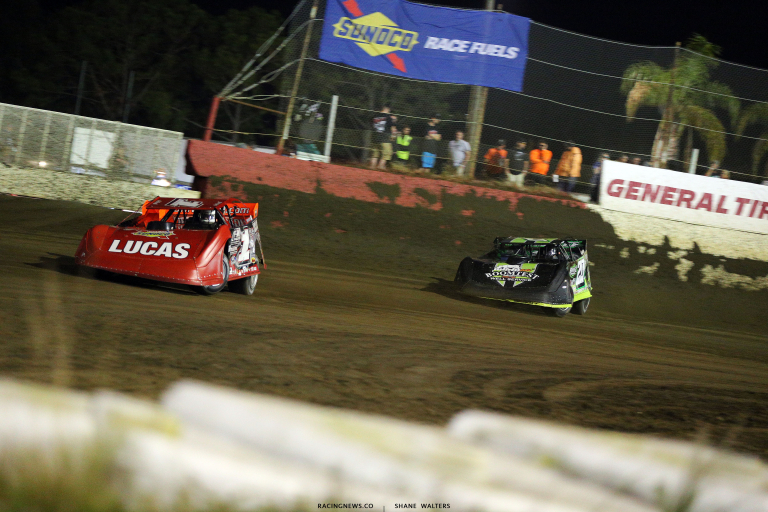 Bronson doors him in turn three. 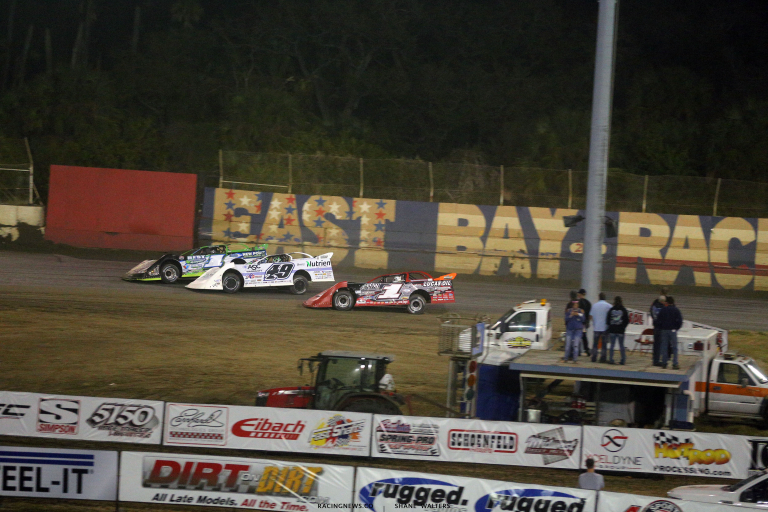 Moyer passes him back as they continue to exchange hand signals after the race. Tyler Erb and Tim Dohm trial the pace truck in heat two. Green, Erb leads Dohm. Dohm suffers a push in the center of the corner. They run three wide under him. They all fight for space down that back. More trouble for Dohm in turn three. He falls to 5th or 6th at the conclusion of lap one. Benedum is hanging with Erb at the front of the field. They both run a car length off the bottom lane. Tyler Erb claims the win in heat two! Earl Pearson Jr and Colton Horner lead them to the starting line in heat three. Green, Pearson leads into turn one. McCreadie follows him through on the bottom. Jameson is three wide for 3rd. Owens is working the top. He clears McCreadie and closes on Pearson. Lap 4, caution for Jameson. Green, Pearson leads. Owens maintains the gap but can’t close. Pearson takes the win in heat three! Tanner English and Colton Flinner lead them to the starting line in heat four. Green, Hudson O’Neal makes it three wide on the bottom! He doors English. They both get out of the gas to correct it. Flinner is on the gas around the top, he leads of turn two. Lap 5, English has run down the leader. He looks to his inside. They run door to door for the lead. Lap 7, Buckingham is around in turn two. The caution is back out. Green, Flinner leads. Richards is working the top. He’s clear of English. Final lap, Richards looks inside of Flinner for the lead. He’s clear by 3 car lengths at the center of the corner with a slide job. All the exit speed is sacrificed. Flinner drives back by. Richards gives it another shot in turn three. He cant get the power down. English swings by on the exit of the corner. Flinner takes the win in heat four! Jonathan Davenport and Earl Pearson Jr set the front row for the Friday night main event. It’s $12,000 to win, the highest payout thus far this week. 50 laps around the 1/3-mile dirt oval. 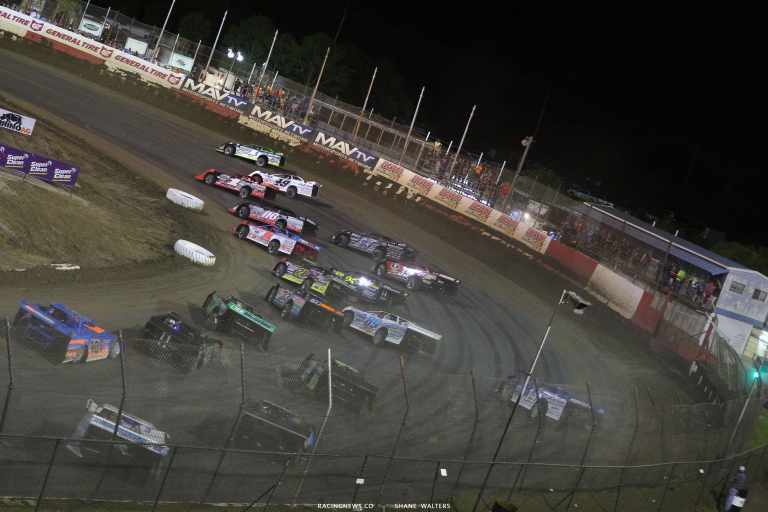 Green flag, Davenport leads on the bottom into turn one. Tyler Erb slots in 2nd. There’s a bump into turn one. Everyone is rolling right through it except the leader. Davenport enters a foot higher and diamonds the exit. Lap 6, Colton Flinner is stopped in turn four. The caution is out. Green, Tyler Erb has a look inside. He pulls to his number but Davenport has the momentum off the corner. Most of the field has moved to the bottom lane. Lap 10, Ryan King is slow down the back. The caution is back out. Green, Pearson has found speed around the top! He runs 2nd off turn two! Pearson sticks with the top for a lap before dropping to the bottom. Lap 14, Tyler Erb moves to the top. Davenport is slow off turn four. Pearson and Erb split him. I’m not sure if he lost drive or spun the tires but he’s rolling again. Lap 25, Tyler Erb leads by six car lengths. Pearson just took 2nd off turn two. Lap 36, Tyler Erb continues to lead. He has a gap of six to Pearson. Caution. I’m not sure what caused it but Richards has fender damage. Green, Erb leads. Hudson O’Neal is around off turn two. The caution returns. Don O’Neal gets a push to the pit area. Green, Erb to the top. Davenport through the middle and Pearson down low. They both get under Erb down the back stretch. 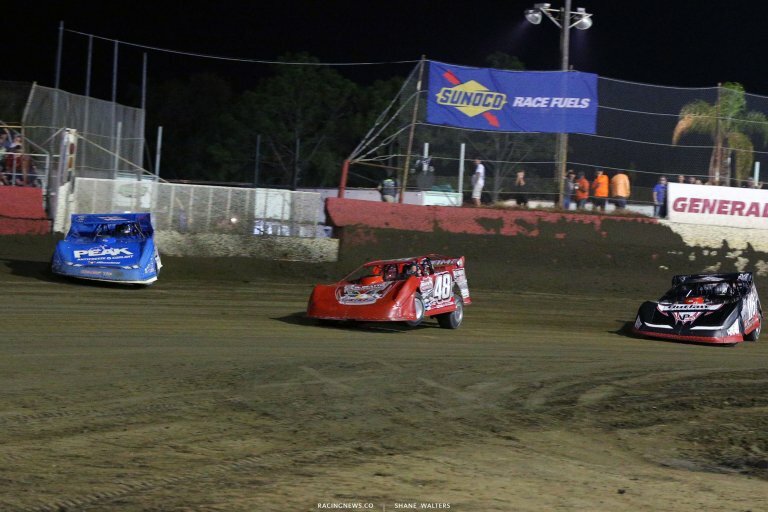 Three wide for the lead heading into turn three. Davenport noses ahead through the middle. Lap 39, Bronson and Hudson O’Neal have issues in turn one. Hudson O’Neal heads to the pits and back out. Bronson goes off on the hook. Green, Davenport leads Erb, Pearson and Bloomquist. The top four spread out quickly. Lap 45, Tanner English is slow. He was fighting for a spot in the top five on that last restart. The caution is out and he heads to the pits. Lap 46, Stormy Scott is around in turn four. The caution is out again. Green, Davenport leads. They run single file around the bottom. 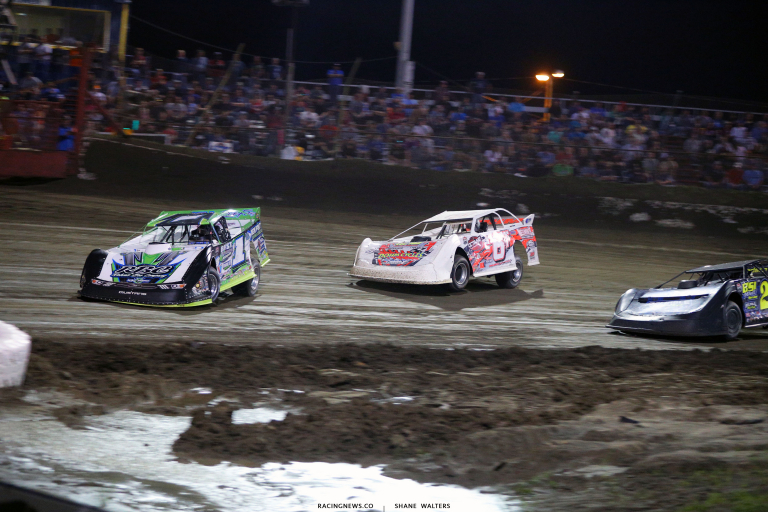 Davenport cruises to the win at East Bay Raceway Park!